What factors are important for long-term Swedish competitiveness and the ability to generate growth? 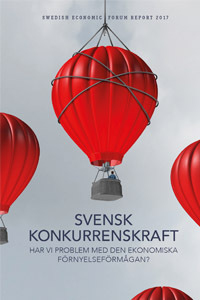 In this year’s Swedish Economic Forum Report you get the answers. Based in the importance of knowledge building for Swedish competitiveness, through the prerequisites for entrepreneurship and value creation, policy-relevant proposals are provided for how Sweden can maintain long-term value in the economy. 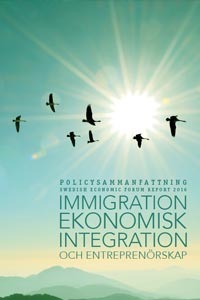 Swedish Entrepreneurship Forum presents this research publication for the ninth consecutive year in conjunction with the Swedish Economic Forum conference. The Report Immigration, Economic Integration and Entrepreneurship aims to focus on how we can better exploit the economic potential of immigrants. The authors mainly analyze four ways of economic integration – education, reduction of minimum wages, employment support and entrepreneurship. Private sector welfare providers sometimes give rise to an intense debate. Mainly, the question about whether the profits private welfare companies make on tax money grants are consistent with – or contrary to – high quality welfare services. Clearly, the motivation the profit gives entrepreneurs are key to innovation and efficiency efforts, which could provide positive welfare effects. At the same time there are challenges and needs for clear rules.